The museum is the permanent home to many of Giger’s key works and contains the largest and most impressive collection of the artist’s paintings and sculptures, furniture and film designs, dating from the early 1960’s till the present day. The museum’s top floor houses a permanent display of Giger’s own private art collection and the Museum Gallery where Giger curates one-man exhibitions on the work of other artists. Guided tours in French, German, Italian, Spanish and English are available upon request. 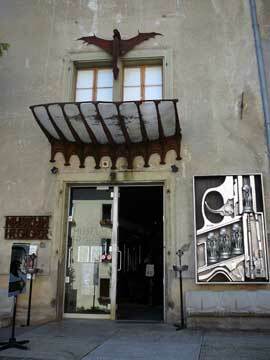 A Giger Bar that was decorated by the artist can be found next to the museum. The HR Giger museum is located to the Gruyères Castle. A special rate ticket gives access to both museums.